← Guess what I’m doing tomorrow! This is the lecture that I gave on ‘Women in the Uniting Church’ as part of Uniting Church Studies at the Centre for Theology and Ministry. There is a lot more here than I shared on the day; the topic is so enormous that it could be a semester unit all by itself. I’d love feedback on which bits were most interesting/useful, and how to improve this for next year. Topic really should be ‘men in the Uniting Church’, since men are the minority. Most recent data I could find was from the 2001 National Church Life Survey, which found that 61% of church attenders are female, meaning that only 39% are men. I don’t think that that would have changed much in the last decade, or that the Uniting Church would be bucking the trend – looking at my own congregations they’re very female-dominated. So, women make up the majority of church attenders in Australia and have since at least the beginning of last century. Maybe today’s topic should be along the lines of how women as the church majority can make the church welcoming to men? Given that it’s not, I’m going to talk a bit about the history, about the roles women played in the uniting denominations, and then in the Uniting Church, and at the end, since you have as much experience of it as I have, if not more, we’ll talk about the place of women in the Uniting Church today. To illustrate, I want to read you extracts from a story written by L. M. Montgomery, the author of Anne of Green Gables, in 1902. 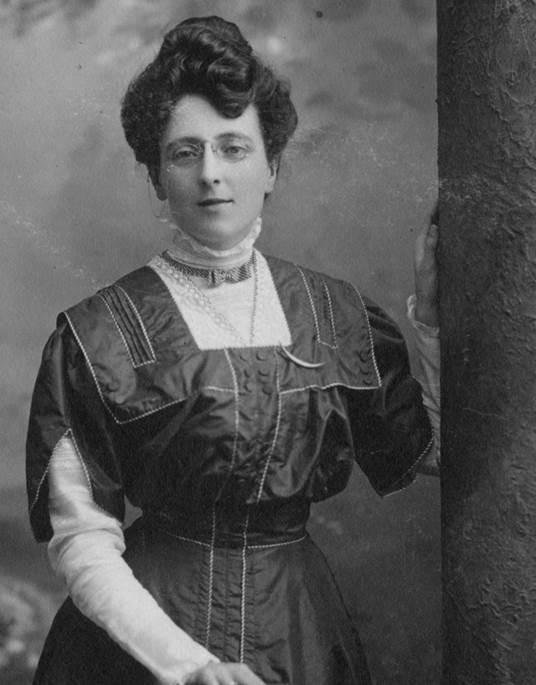 Montgomery was born and bred a Canadian Presbyterian, and would later marry a Presbyterian minister and spend the rest of her life in manses, so she was an accurate observer of the Presbyterian scene. This story is Canadian, but it could just as easily be set in Australia. ‘Presently Frances Spenslow came in. Frances was organist, but today, instead of walking up to the platform, she slipped demurely into her father’s pew at one side of the pulpit’. In the end, of course, the men give in; Mrs Cotterell is allowed to speak from the pulpit about foreign missions and the strike end. Women weren’t just the willing workers in the background. They were also leaders. 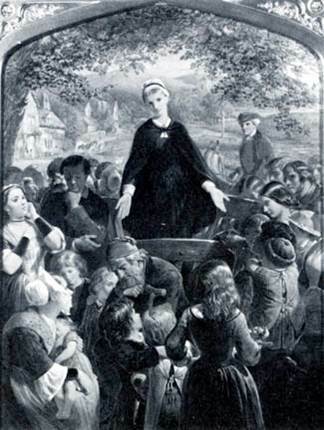 In early British Methodism, a number of women served as Local Preachers. While she was near Seth’s tall figure, she looked short, but when she had mounted the cart, and was away from all comparison, she seemed above the middle height of woman, though in reality she did not exceed it—an effect which was due to the slimness of her figure and the simple line of her black stuff dress. The stranger was struck with surprise as he saw her approach and mount the cart—surprise, not so much at the feminine delicacy of her appearance, as at the total absence of self-consciousness in her demeanour. He had made up his mind to see her advance with a measured step and a demure solemnity of countenance; he had felt sure that her face would be mantled with the smile of conscious saintship, or else charged with denunciatory bitterness. He knew but two types of Methodist—the ecstatic and the bilious. But Dinah walked as simply as if she were going to market, and seemed as unconscious of her outward appearance as a little boy: there was no blush, no tremulousness, which said, ‘I know you think me a pretty woman, too young to preach’; no casting up or down of the eyelids, no compression of the lips, no attitude of the arms that said, ‘But you must think of me as a saint.’ She held no book in her ungloved hands, but let them hang down lightly crossed before her, as she stood and turned her grey eyes on the people. There was no keenness in the eyes; they seemed rather to be shedding love than making observations; they had the liquid look which tells that the mind is full of what it has to give out, rather than impressed by external objects. ‘That man of God was Mr. Wesley, who spent his life in doing what our blessed Lord did—preaching the Gospel to the poor—and he entered into his rest eight years ago. I came to know more about him years after, but I was a foolish thoughtless child then, and I remembered only one thing he told us in his sermon. He told us as ‘Gospel’ meant ‘good news.’ The Gospel, you know, is what the Bible tells us about God. ‘Think of that now! Jesus Christ did really come down from heaven, as I, like a silly child, thought Mr. Wesley did; and what he came down for was to tell good news about God to the poor. Why, you and me, dear friends, are poor. We have been brought up in poor cottages and have been reared on oat-cake, and lived coarse; and we haven’t been to school much, nor read books, and we don’t know much about anything but what happens just round us. We are just the sort of people that want to hear good news. For when anybody’s well off, they don’t much mind about hearing news from distant parts; but if a poor man or woman’s in trouble and has hard work to make out a living, they like to have a letter to tell ‘em they’ve got a friend as will help ‘em. 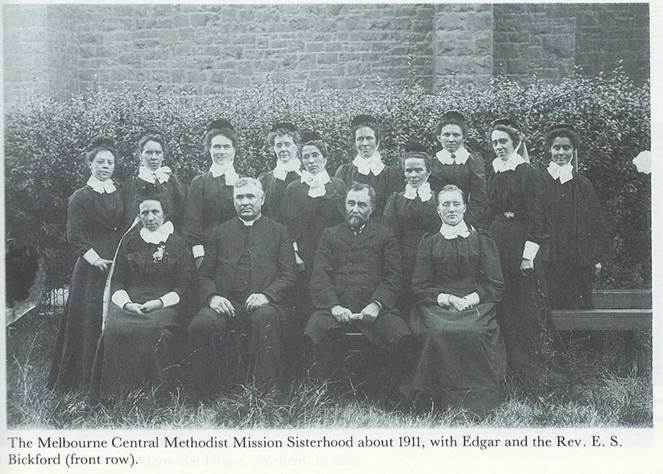 However, in Wesleyan Methodism from 1803 women were restricted to addressing women-only meetings. The ban that wasn’t lifted until 1910. 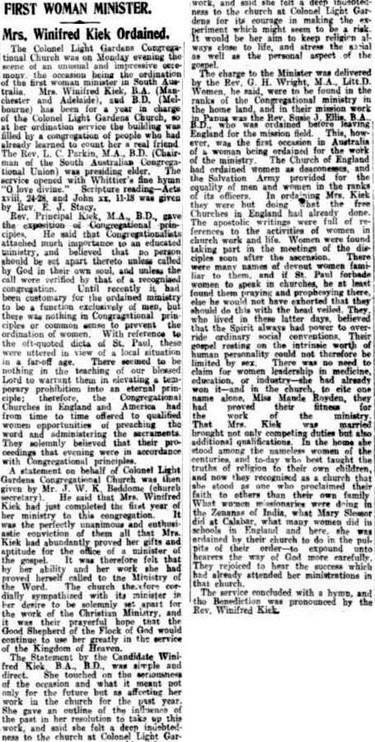 From 1918 on, Wesleyan Methodism recruited and deployed women Local Preachers on exactly the same basis as men. These usually involved women in ministering to other women, to children and to ‘the poor’. There were some official ‘orders’ in which women worked, for example at Methodist Central Missions as ‘Sisters of the People’. In 1884 the Central Methodist Mission in Sydney set up a training home for them. The job included visiting homes, the prison, the hospital, emergency relief, and running programs for women and children. Immigrated from Scotland via New Zealand and arrived in Australia at the age of forty-four. Shared a cottage in Little Collins St at the rear of the Assembly Hall with Mrs Maria Lord Armour (Honorary Treasurer of Scots’ Church in 1883). On 24th November 1891 a large crowd gathered alongside the Point Nepean Road at Cheltenham to witness the opening of the new Livingstone Home. It was a two storey double-fronted brick building facing Point Nepean Road. The fourteen rooms could now accommodate twenty five children; more than double the number at the North Carlton House. May our Home now opened be the door through which many may be led to lives of, honour, virtue, and distinction on earth, and to life everlasting in our Father’s home on high. 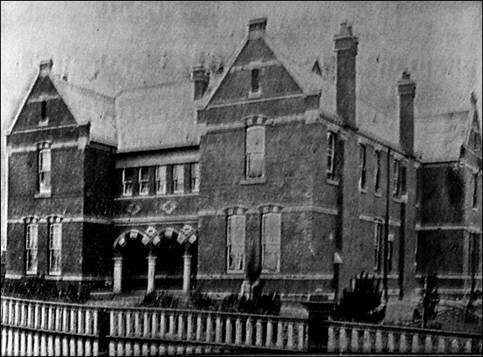 Director of the Burnley Kindergarten, opened in the Presbyterian Mission Hall in Crown Street in 1906, supported by the Kew Presbyterian Church. Apparently an inspired teacher who influenced the whole district. Article from Richmond Guardian Saturday 20 April 1918. THEIR HAPPY HOURS CHILDREN OF KINDERGARTEN. PLEASURE & PLAY ACCOMPANY BABY’S SCHOOL LESSONS. By Violet Hibbs. And as for the children – it isn’t school at all. As one of them went home and said after the first day, ‘It is just play, mummy, and all right play, too.’ This branch of the Kindergarten Union owed its formation originally to a number of ladies resident in Kew. It has progressed considerably. The kindergartens receive the child when the first glimmerings of intelligence begin to show themselves, and the little mind is as receptive to impressions, good or evil, as the sun-baked desert is to rain. The average age of the pupils attending the Burnley Free Kindergarten is from three to six years, but there are some who have yet to pass their third summer. … The teachings of the kindergarten start with home life first of all. That is nearest and most familiar to baby’s comprehension. He is taught the relative importance and position of every member of the family. He is taught self-sacrifice; he must be as helpful as he can, to relieve mother of worry, to grow up a little man instead of a troublesome encumbrance. These teachings are paramount in regard to the future man’s battle with life keystones for a worthy career. Then comes instruction in other circles, all leading up to the later course. The daily talks by the principals and her assistants are, perhaps, the greatest factor in the growth of the creative instinct in the child. The speaker selects a familiar -topic and presents it in story form. She gets the child’s thought concentrated on it and leads him step by step till he or she has grasped the subject. 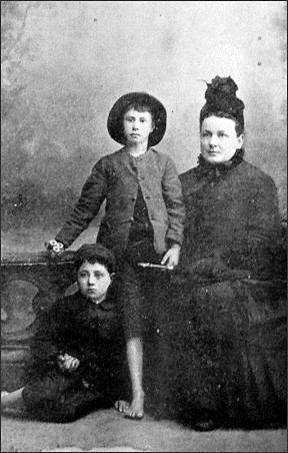 Then, by skilful questioning, she enables the child’s mind to progress unaided and form his own ideas on the matter. Some of them are very quaint. The subject a few mornings ago was ‘Our Soldiers’-certainly a topical one, considering the surroundings and the khaki-clad men who passed from door to door while the lesson was in progress. The speaker traced their lives from their first drill in the hall to their entry into camp and departure to the front. Then she dwelt on the uniform, and the ‘different uses for his equipment. So one of the answers to a question: ‘Why do soldiers wear khaki?’ was a bit of a surprise. ‘Because they look nice in it,’ was the contribution of one little girl. Another answer which showed some thought was ‘So that we can know they are soldiers,’ and so on. Meanwhile the children squat like Indians in the fairy circle (to suggest unity) in the middle of the drill hall floor, and ponder the lesson with a graveness which is distinctly trying to the looker-on’s sense of humour. Then come the games. Here again is evidence of a definite plan. The most popular games are nursery rhymes set to action by the principal. Thus, the habits and actions of different animals, ships, flowers and even feathers are made familiar to the children. A little object lesson of a soldier, marching and standing at attention, immediately produces straight backs and puffed-out chests. It is never too early for children to learn to deport themselves correctly. The children are taught the value of soap and water in maintaining a bright and neat appearance. Their health is the concern of a nurse, who attends once a week, and who also visits the homes and gives advice when required. About 11:15 the children are given a few minutes in the yard to themselves, while the selected ‘housekeepers’ from each grade prepare the morning refreshment. This consists of milk and biscuits, tastefully arranged on low tables, with a white cloth and a vase of flowers complete. Six tiny chairs are drawn up by each seriously-minded housekeeper (often not much higher than the table) and six pretty cups, to be filled when grace has been said. Even during the important business of eating and drinking the training is not neglected. Courtesy at table is demonstrated by the pupil teacher in charge, and each strives to outdo his or her neighbour in politeness. The hearty co-operation of the mothers has been a great help to the kindergarten workers. 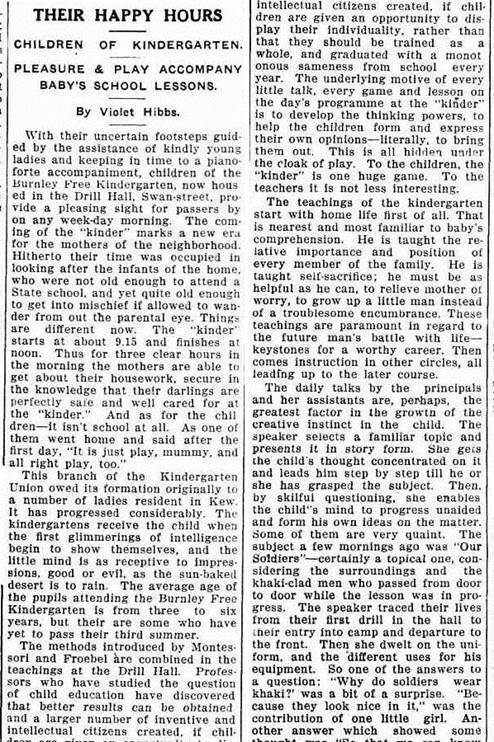 The training that the children are receiving will make their future up-bringing easier, and the mothers show their appreciation by helping the teachers in all sorts of unexpected ways … Miss Norah Semmens is the principal of the Burnley Free Kindergarten with Miss D. Carlile as chief assistant. A ‘Wesley Deaconess Order’ and a United Methodist Church Order of Deaconesses were founded in the last 1800s, but there wasn’t any real effort to given the training. 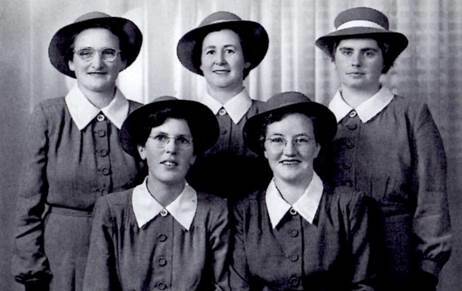 The Order of Deaconesses was founded by the Methodist Church in Australia as a result of an inability to put into practice the principle affirmed by the General Conference of that church that women should be accepted as candidates for the Methodist Ministry: that is, that ‘an unmarried woman called to the work of the ministry should be allowed to offer as a candidate’ for the Ministry of the Word and Sacraments. 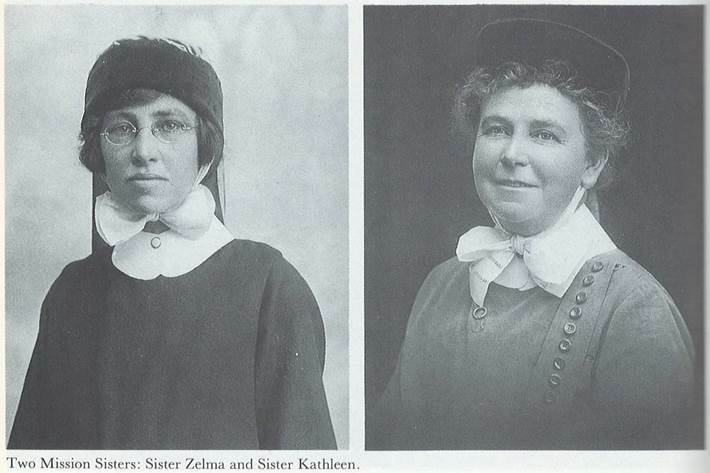 The question of Ordination of Women had been raised in the General Conference of 1929 when, by a vote of 68 in favour and 65 against, the question was referred to a committee (of twenty men) and the annual conferences of the different states and to the quarterly meetings and synods. In 1935 the General Conference reaffirmed the principle of the Ordination of women, but because of the practical difficulties of the itinerant system of stationing ministers, it could not see its way clear to accept women candidates. An Order of Deaconesses was then suggested as an ‘acceptable and workable alternative’, which would offer ‘suitable opportunity for consecrated service’. The first Deaconesses were received into training in 1943, and the first three Deaconesses were ‘dedicated’ not ordained, in 1946. Those first three were Norma Anguey, Nancy Chinchen and Doris Scobie. 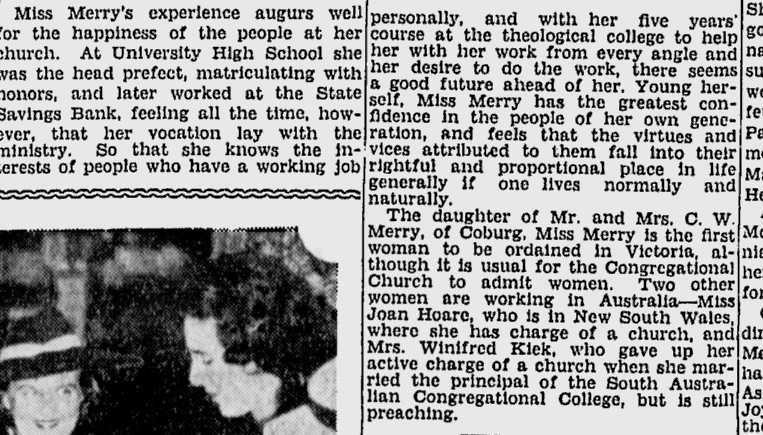 In 1963 it was agreed that Deaconesses in full membership could be ordained. 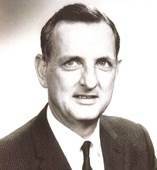 In 1967 Rev. Bev Bellinger was ordained as a Deaconess, which leads us to the next section. It was the Congregationalists who ordained the first woman in any of the Uniting Churches. The first woman was Winifred Kiek, the wife of Rev. 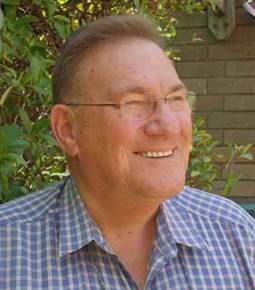 Stanley Kiek, the Principal of the Congregationalist Training College in Adelaide. FIRST WOMAN MINISTER. Mrs. Winifred Kiek Ordained. The Colonel Light Gardens Congregational Church was on, Monday evening the scene of an unusual and impressive ceremony, the occasion being the ordination of the first woman minister in South Australia. Mrs. Winifred Kiek, B.A. (Manchester and Adelaide), and B.D. (Melbourne) has been for a year in charge of the Colonel Light Gardens Church, so at her ordination service the building was filled by a congregation of people who had already learned to count her a real friend. Rev. 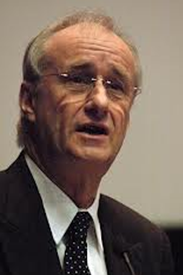 Principal Kiek, M.A, B.D. gave the exposition of Congregational principles. 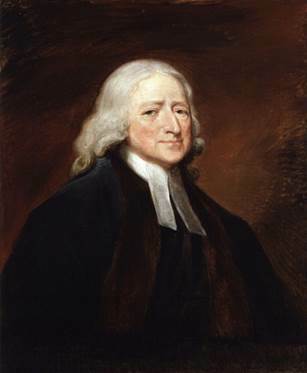 He said that Congregationalists attached much importance to an educated ministry, and believed that no person should be set apart thereto unless called by God in their own soul, and unless the call were verified by that of a recognised congregation. Until recently it had been customary for the ordained ministry to be a function exclusively of men, but there was nothing in Congregational principles or common sense prevent the ordination of women. A statement on behalf of Colonel Light Gardens Congregational Church was then given by Mr. J. W. K. Beddome (church secretary). He said that Mrs. Winifred Kiek had just completed the first year of her ministry to this congregation. It was the perfectly unanimous and enthusiastic conviction of them all that Mrs. Kiek had abundantly proved her gifts and aptitude for the office of a minister of the gospel. It was therefore felt that by her ability and her work she had proved herself called to the Ministry of the Word. The church therefore, cordially sympathized with its minister in her desire to be solemnly set apart for the work of the Christian Ministry, and it was their prayerful hope, that the Good Shepherd of the Flock of God would continue to use her greatly in the service of the Kingdom of Heaven. The Statement by the Candidate Winifred Kiek. B.A., B.D., simple and direct. She touched on the seriousness of the occasion and what it meant not only for the future but as affecting her work in the church for the past year. She gave an outline of the influence of the past in her resolution to take up this work, and said she felt a deep indebted ness to the church at Colonel Light Gardens for its courage in making the experiment which might seem to be a risk. It would be her aim to keep religion always close to life, and stress the social as well as the personal aspect of the gospel. The service concluded with a hymn, and the Benediction was pronounced by the Rev. Winifred Kiek. Rev. 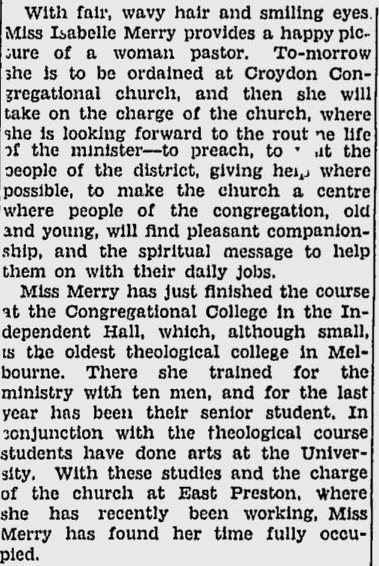 Isabelle Merry was ordained in 1937, the first woman ordained in the Congregationalist Church in Victoria-Tasmania. Rev. 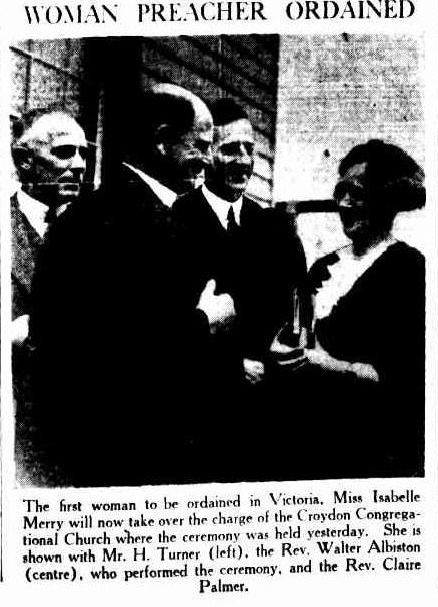 Isabelle Merry was inducted at Croydon on 12th December 1936, the first woman to be ordained as a minister in any denomination in Victoria, and Belle served there for nearly seven years. Subsequently, Belle left to pursue studies in Social Work and was then appointed as the first full-time Chaplain of a public hospital—the Queen Victoria—where she served for 30 years. She continued her association with the Gifford Memorial Church, and later the Gifford Group, until her death. In 1976 she was awarded the OBE for her chaplaincy services. With little prior debate, the General Conference of 1966 supported a recommendation by the General Truth and Order Committee that the laws of the church be altered to allow the admission of women into the ordained ministry. Rev. Dr Coralie Ling, a deaconess, was ordained in 1969, the first woman ordained in the Methodist Church in Victoria-Tasmania, and the second in Australia. In 1962 a Presbyterian Committee reported to the Presbyterian Assembly that it was of the opinion that the whole discussion of the place of women in the ministry of the Church had to be put into a wider context. 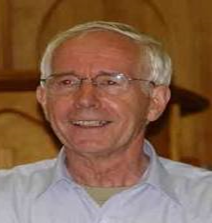 A committee was established on the Service of the Laity in the Church and Community, which reported in 1964 that special work had been done by the Revd Alan Smart BA, BD specifically on the place of women in the ministry of the Word and sacraments. 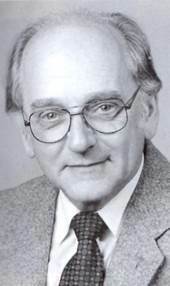 Mr Smart’s interim report provided information from contacts made with overseas groups studying this question, namely, the Church of Scotland, the United Presbyterian Church in the USA, the World Alliance of Reformed Churches and the World Council of Churches. To the question with which this report began, namely, ‘whether a Reformed Church, which is under the authority of the Word of God contained in Holy Scripture, may admit women to the ministry of Word and sacraments’, we can now answer with a decisive ‘Yes’. A Reformed Church not only may, but ought to admit women to the ministry of the Word and sacraments in the light of the present day understanding of the Word of God contained in Holy Scripture. 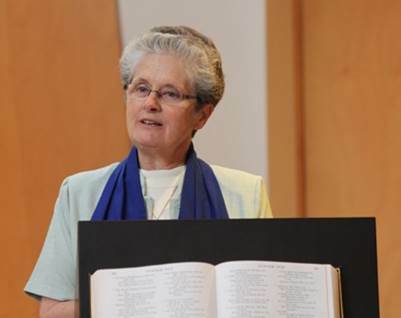 The first women ordained in the Presbyterian Church Marlene (‘Polly’) Thalheimer in 1974. 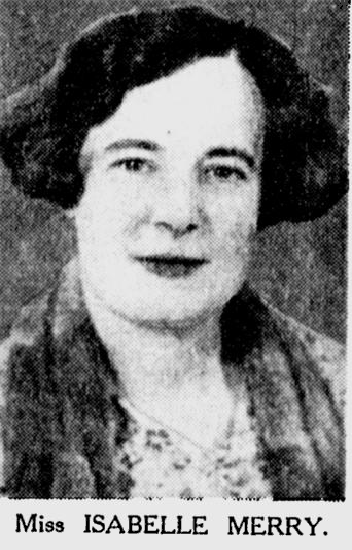 She became Minister at Romsey and Lancefeld and was there when Union took place. The Methodist Church was discussing women’s ordination at the same time that the vote for Union was getting close. During the discussion the Rev. 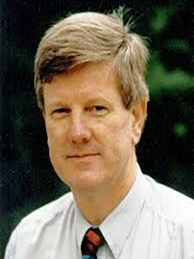 Dr Eric Osborn argued the ‘no’ case, saying he feared that passing this motion would hinder ecumenical relations and damage the delicate negotiations concerning Church Union. 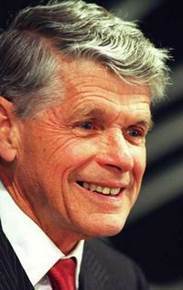 the most tireless, silver-tongued and able advocate for Church Union the Rev. 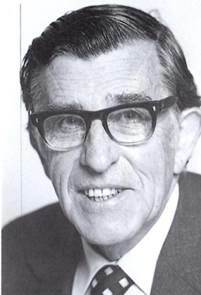 Dr A. Harold Wood who had campaigned for Union along with World Peace, in and out of season, spoke in favour of the motion, and ‘did not think it would hamper ecumenical work’. 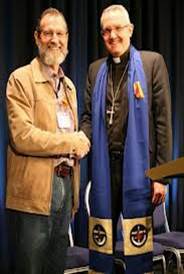 It would be a bold ecumenist who would dare to disagree with Dr Wood on his own ground! The three uniting denominations came into Union all ordaining women, and the ex-Methodist Deaconess Rev. 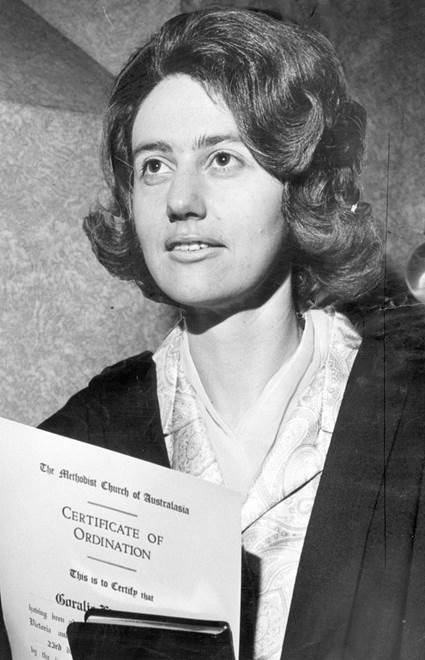 Bev Bellinger was the first woman ordained in the Uniting Church. The best thing I can do is share with you part of the Report ‘Why Does the Uniting Church in Australia Ordain Women to the Ministry of the Word?’ released in 1990 by the Assembly Standing Committee. The Uniting Church, from inception, will seek the guidance of the Holy Spirit to recognise among her members men and women called of God to preach the Gospel, to lead the people in worship, to care for the flock, to share in government and to serve those in need in the world. Candidates asking the Church to ordain them as ministers in this denomination must understand and affirm the Basis of Union in total before their ordination can take place. 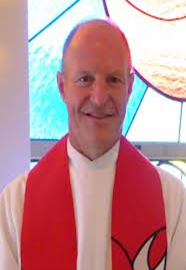 If they cannot in good conscience affirm the ordination of women or work together in joint settlement with women ministers, we believe it would be wrong to ordain them to a ministry in the Uniting Church. It is true that: To adhere to the Basis of Union is understood as willingness to live and work within the faith and unity of the one holy catholic and apostolic Church as that way is described in this Basis. Such adherence allows for difference of opinion in matters which do not enter into the substance of the faith. The fact that the Uniting Church started its life ordaining women does not mean that we have been a beacon of gender equality. 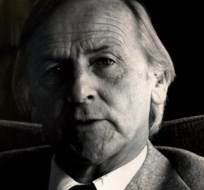 In 1974 a letter appeared in the New Spectator written by the then Dorothy McMahon, pointing out that of the group of 70 who were going to put together the Uniting Church Constitution, there were to be six Presbyterian women, four Congregationalist women, and two Methodist women. 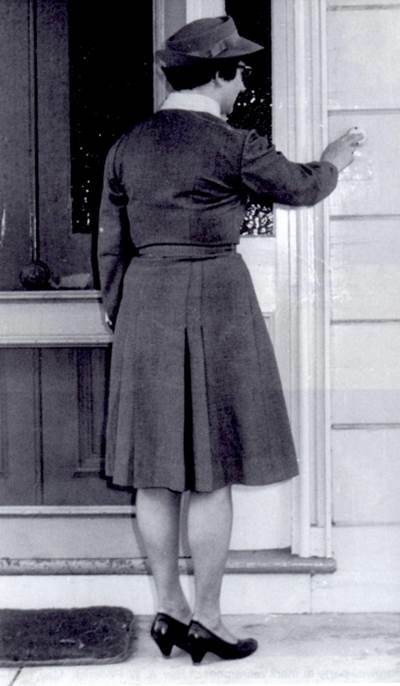 Whether or not it was the result of Dorothy’s letter, steps were taken to ensure the full involvement of women in the new Uniting Church. In 1986 and 1987 a survey was conducted to discover the extent of women’s participation in the structures of the Uniting Church. The results of the survey were published in 1989. In 2002 Gospel and Gender was disbanded. Is that because there’s no longer any need for such a group? 8. 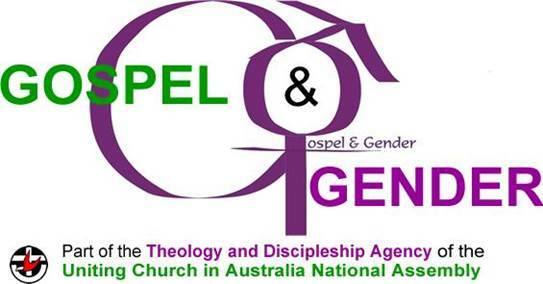 Invite other denominations to consider the theological position of the Uniting Church in Australia on the ordination of women and authorise those who represent the Uniting Church in ecumenical dialogues to use the document as an exposition of that position. To satisfy LCA requirements a minister or pastor called to provide pastoral and sacramental ministry to cooperating LCA-UCA congregations must be male and not be in a same gender relationship. To satisfy UCA requirements the minister or pastor must be willing to work with and support women and men, both lay and ordained, as colleagues in their appointed ministries. The minister or pastor retains oversight of liturgical leadership within the cooperating congregations. In calling a Pastor/Minister each church needs to be sensitive to the formal processes of the other. 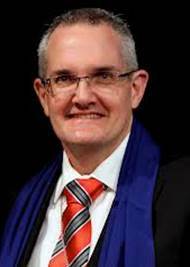 The Uniting Church needs to be sensitive to the issues affecting the Lutheran Church, for example, male only ordination, and ordained presidency. Likewise, there needs to be an awareness of differences in theology and ecclesiology around the ordination of women, and greater lay involvement in leadership. Are we being overly-ecumenical, or is the balance right? That was in 1997. Is it still true? Of course, Anglo-Celtic members of the church do much better on women’s equality than CALD parts. (Sarcasm). Is the ratio of 13:1 male:female heads of the Uniting Church a problem? Carey, Hilary M., Believing in Australia: A Cultural History of Religions, St Leonards, Allen and Unwin, 1996. Feith, Betty, Women in Ministry: The Order of Deaconesses and the Campaign for the Ordination of Women within the Methodist Church 1942-1977, Glen Iris, Kyarra Press, 1990. Fisher, Judi and Janet Wood (ed), Colours True and Splendid: the decade of the churches in solidarity with women, Gospel and Gender, National Assembly of the Uniting Church in Australia, Sydney South, 1999. Richardson, Robyn, Katalina Tahaffe and Nonie Wales, ‘Sing About Life, Sing About Possibilities: Women and the Uniting Church’, in William W. Emilsen and Susan Emilsen (ed. ), Marking Twenty Years: The Uniting Church in Australia 1977-1997, UTC, North Parramatta, 1997, pp. 224-36. Tabart, Jill, ‘What I Know Now’, in William W. Emilsen and Susan Emilsen (ed. ), Marking Twenty Years: The Uniting Church in Australia 1977-1997, UTC, North Parramatta, 1997, pp. 15-25. West, Janet, Daughters of Freedom: A History of Women in the Australian Church, Sutherland, Albatross, 1997. Aside | This entry was posted in Random Musings and tagged church history, Uniting Church, uniting church in australia, Uniting Church Studies, women, women's history. Bookmark the permalink. Sorry, Paul! I hadn’t picked that up. And, yes, Polly’s first placement was my first placement; I was so excited when I found that out! Avril, it’s interesting you mention a 61-39 gender ratio in the UCA (from the 2001 NCLS). In the UCA congregations I know, the percentages of men attending worship are far lower than that. One of the students in the class had access to the most recent NCLS stats (I wasn’t willing to pay money for them) and found that membership of the Uniting Church, which isn’t quite the same thing as church attenders, is now 60% women 40% men. But it would be good to get some accurate details from the Assembly or Synod. Whatever the numbers, I think we’re still looking at a situation of women being the majority in the pews and the minority in leadership. Thanks for this Avril, especially for my favourite passages from Adam Bede. I guess it’s like any other group – get in a reasonable number of them and the congregation will seem welcoming to others of that demographic. As with children and teenagers. Thanks for the article Avril. Just some information on our congregation at Forster Tuncurry Uniting. Whilst I am the current pastor ( and male) our last two ordained ministers in placement have been women. Our two lay presiders are women and both our worship teams are facilitated by women. Of our 9 church council members, 6 are women and three are male. Possibly times have or are changing. That’s good to know, Geoff. I think the Uniting Church is streets ahead of most denominations when it comes to the equality of women and men. I’m very proud of us, even though there are areas in which we can improve. So it’s lovely to hear about another church that is benefiting from women’s leadership. Thanks! The Catholics will get there. the Church is 2000 years old and most protestant churches have been ordaining women for less that 5% of that time. The Catholics and Orthodox will catch up, eventually.